What an easy and enjoyable thing photography can be when the subject cooperates. I have been planning to do a posting on the Verrazano Bridge for sometime but this requires a special trip and is quite some distance from my home in Manhattan. And one must find a good vantage point, negotiating around the Belt Parkway (a major highway with some limited parking) and the many other thoroughfares - 4th Avenue, Shore Road, Route 278 to the bridge and a cloverleaf of highway ramps. However, I could not have picked a better day. A heavy fog had settled in just occluding the more distant tower. See here for a series of photos. 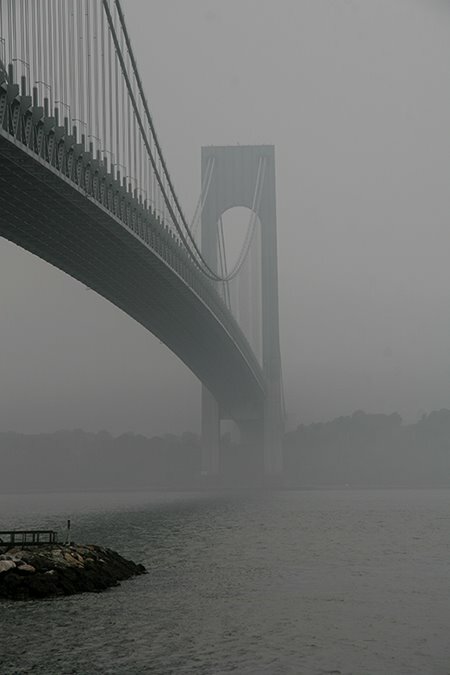 The Verrazano-Narrows Bridge is a relatively modern bridge, only completed in 1964. I have always found its lines rather clean and elegant. The bridge is omnipresent in the NYC skyline and is visible from every borough of the city. It connects Brooklyn and Staten Island. Although controversial during its construction, it is a lifeline - providing a roadway not only to Staten Island, but a connection between New Jersey, Brooklyn and Long Island. At the time if its construction it was the longest suspension bridge in the world (4,260 feet (1,298 m) and held that position until 1981. It still remains the longest suspension bridge in the United States. You can read more about it here.